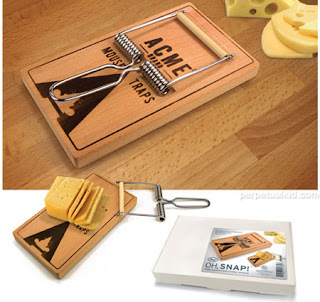 Mouse traps give me the creeps. Just hearing the horrid 'snap' sound drives me loony and brings back images that do not bear repeating. It's with some trepidation that I offer up this kooky cutting board and cheese slicer. Yeah, it's funny alright, but I'm not sure that it's silly enough to remove the mouse murder movies playing back in my memory.